Jacob has a fulfilling job in Toronto as a counsellor at a men’s outreach centre; men living with HIV. When he is asked to come home to Advocate, the small town in Nova Scotia where he grew up, to say good-bye to his dying grandmother, he has severe misgivings. He remembers the events of 1984 well; when he was 11 years old and his Uncle David came home after being away for more than a decade. Uncle David has full blown AIDS and has come home to die. His grandmother is not happy to see him and she’s definitely not happy to have him at her house as he slowly fades away. Young Jacob becomes witness to the fear and panic brought on by the first cases of AIDS in the country. He witnesses the arguments his mother and aunt have with his grandmother, and with the rest of the town as they are gradually alienated by almost everyone. The full review of Advocate can be read at The Miramichi Reader. Darren Greer’s Just Beneath My Skin won the Thomas Raddall Atlantic Fiction Award in 2015. This year, Advocate was a finalist for the same award. 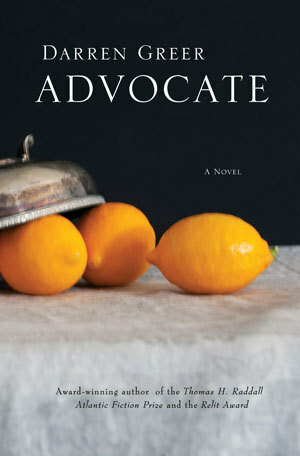 Advocate is also the winner of the 2017 Jim Connors Dartmouth Book Award for Fiction. I definitely plan to seek out his other books at some point in the future. I remember looking at this book at one point, but I wasn’t sure. Thanks for this review, I think I would like to check it out. I was surprised how much I liked it. Like I said in my review, I worried that I wouldn’t find the subject all that compelling. He’s a good writer! This sounds right up my street. Small towns offer such an interesting canvas for issues like this. I love stories set in small towns! Thanks for writing this review for the Miramichi Reader, Naomi! And thanks for writing your review of “Mountain” for Consumed by Ink! This sounds so good but also potentially really hard to read. I suspect I’d like it, though. I didn’t find it overly hard to read. Because most of the story is narrated by 11-year-old Jacob, it’s actually quite light and sometimes funny. It was a good move on the author’s part to write from the perspective of a boy. This sounds excellent, if a bit traumatising to read. I also love a book set in a small town. Because the author wrote it mostly from the perspective of an 11-year-old boy, it’s not as tough a read as you might think. For example, even though the grandmother holds “old-fashioned” views on many subjects, her character can also be quite amusing to read about. The character of Jacob, as well. Thanks! I think you’d like it! This sounds like an intriguing story. I am surely going to read this one. 🙂 Thank you for this post. Except for time, on my end. I find I’m shorter on time in the summer because the kids are around more and they go to bed later. Sometimes it’s as simple as that, but sometimes I just write something and feel like it’s enough. In this case, both played a factor. Do your kids have any big plans this summer? Camps? More trips? My son has a football camp for a week in August, and he’s been mowing lawns for people a couple days a week. My youngest daughter is taking swimming lessons at the outdoor pool. We’re in Nova Scotia. Not everyone speaks French, but there is a large Acadian population in the Maritimes, so many people do. My kids go to the Acadian school, so they’re all bilingual now. My husband went through French Immersion, so he can also speak French. But where I grew up there wasn’t an option for French yet (there is now), so I’m the only one in the house who can’t speak it well. I’m pretty good at reading it, though. The only sleep-away camp I ever went to was in Grade 5 for one week and I was really homesick, so I feel for your 13-year-old self. Two weeks of it!! You got picked up by another site? How cool is that? I love the cover of the book, by the way. James and I did a book review swap! The cover is nice, isn’t it? It was fun! We may do it again at some point. I like the swap which you have done with this other blogger. The story sounds like a tough one; I can imagine what the lead character would think of the grandmother but it seems at the end something makes him reconsider. The fact that she wants him to do her eulogy surprises me too. I’ll have to read it to find out! The relationship between Jacob and his grandmother is well done – it’s not black and white. There’s resentment and anger, but there’s also love and affection. Definitely worth reading! Yes, I found the characters very believable and real. Even though I didn’t agree with the grandmother on many things, I still liked her for other reasons. And it’s good to hear you laughed in a few parts, because I was starting to wonder if I was remembering it right. I didn’t find it too hard to read at all.